THE SCENE: 70 degrees and a little bit of rain that turned into a lotta bit of rain halfway through. Welcomed and disclaimed. Nantan took a wrong turn and missed this part. Partner 1 Farmer carries two CMUs down the horse show arena stairs and back up while Partner 2 does the following exercises. Once Partner 1 returns, flapjack. Encouraged the PAX to be selfless with their time, knowledge and resources. Don’t be afraid to let others get praise and encouragement. Spend your time pouring into others rather than hoarding what you have. A lot of potential at this AO. Looking forward to what can be done here. THE SCENE: 55 degrees or so. It felt cold at first, which was super nice once we got moving. Bear Balls and Squats – PAX place feet on the wall and walk themselves up to Bear Balls to the Wall. Walk it back down, then perform Squats x 10 OYO. Rinse and repeat for about 10 minutes. Wall of Fire – In rotating fashion, one PAX performs 10 Merkins, 10 LBCs, 10 Burpees while the other PAX hold People’s Chair on the wall. Rinse and repeat for about 10 minutes. Escalator – Jump-ups x 10 OYO, Burpees x 20 OYO, Merkins x 30 OYO, Squats x 40 OYO, Lunge Walk x 50 (each leg) OYO. Bear Balls and Squats – about 5 minutes. CIRCLE OF TRUST/BOM: YHC encouraged the PAX to identify things in their life that keep them from focusing on things that require their attention. The race is long, so shed the weight that you can. MOLESKIN: Good reminder this morning why I love small workouts. High hopes for Gaisman as a Thursday AO. High hopes that they empty the trash soon. THE SCENE: Little Rock, AR. YHC took the M and 2.0s over the night before for a short getaway. Five other Memphis PAX were clown-carring over Saturday morning. YHC had thoroughly scoped out War Memorial Park on Google Maps ahead of time. I had not, however, checked about events at the stadium. I arrived at the park at 0600 to put the finishing touches on my workout plan, only to be greeted by some municipal employees who were closing the road to our parking lot! Instead of spending the next 45 minutes in blissful peace, putting the final touches on my weinke, YHC was texting, tweeting, attempting to facebooking to make sure people knew about the change. Did it work? Perhaps. We had 4 FNGs show up (one left less than 10 minutes into the workout). YHC can only assume 15-20 drove to the original meeting spot and were turned away. Once the Memphis PAX arrived, another municipal worker came to warn us that police might be coming to close more roads and that would be followed by millions of tailgaters. We decided to stand our ground, come what may. In the end, there were no tailgaters or police. We had other things to sweat over – like burpees. Lil’ mosey over to a field. B.O.M.B.S. – The PAX partnered up. P1 started on reps while P2 moseyed about 30 yards to a retaining wall, did 5 SSH, and moseyed back. Cumulative rep targets were: 50 burpees; 100 overhead claps; 150 merkins; 200 big boy sit-ups; 250 squats. Next, we took a little mosey down the walking trail (stopped for flutter kicks while we waited on the six), carefully crossed the road, and came to a stone retaining wall. Here we did dips, step-ups/box jumps, and derkins – repeating some, forgetting others. Another mosey, circling back around to our start point. We stopped for some plankage, then did some core work near our BOMBS field: hello dolly, rosalita, BBSU. Next, mosey to path near start point – ATMs (10 IC shoulder taps, 10 IC slow-count merkins, 10 fast merkins OYO), WWI sit-ups, ATMs, LBC, pickle pounder, J-Lo. Shoulder blaster at lot, courtesy of Phat Pat. He’s a slow runner, but great at telling people where to point. YHC shared the concept of Sad Clown Syndrome and how my own life has been impacted by F3. Hopefully we’ll get things going in The Natural State very soon! Whatever happens in Arkansas in the future, this was a good time. 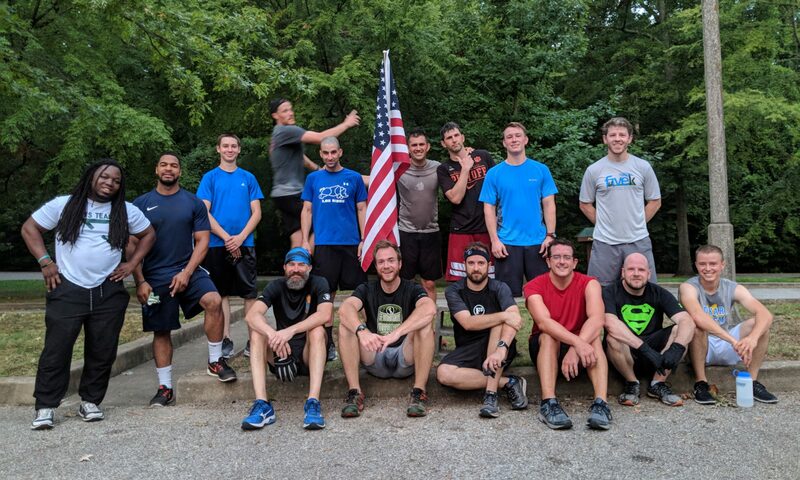 The PAX pushed through and the FNGs didn’t miss a beat. We had 100% retention for coffeeteria at River City Coffee (coffee ice cubes are super), and hopefully planted some seeds for F3 in central AR. THE SCENE: Gaisman Park! YHC had to walk 100 yards to the park. I now know how Slicnut feels being able to walk into the gloom. YHC was inspired by a Bruce Lee workout I found online but slightly modified so death did not come upon us. Even with the modification, death nearly came upon us. 4 PAX came to Nutbush, a.k.a Berclair to do hard things. YHC read from Matthew 16 where Jesus asks the disciples, “who do people say I am?” and “who do you say I am?” There was a conversation YHC had with the 2.0’s the other night that led to personal conviction. Do I truly live my life in a way that declares what I say with my mouth of who Jesus is? Do I actually act like Jesus is the Son of God? Do I love others in light of what the gospel has done for me? Not always. It was a gut check for my spirit when talking with my 2.0’s and motivation to set an example for them on what a life with Jesus as Lord really looks like. I fail often, but I hope to be a better example and leader. Sooooo thankful that the pax came and worked out with me. We took our picture in YHC’s front yard with the Puerto Rican flag in the background. Great Black Ops at Gaisman. This AO has tons of potential. I believe Heavyweight, Meatball, and Bookworm would love the convenience and so would YHC!! I also loved the smaller workout of 4 pax! Led to some awesome and honest prayer request. Really encouraging watching Teacher’s Pet smack around that routine! There was ZERO quit in him today! THE SCENE: Beautiful Evening, plagued with skeeters. The list of things in my vehicle are growing (toilet paper, epi pen (for grass allergies), and now bug spray. Repeat the above for a full 4 sets. When Slots and Four Eyes crossed the finish line we cut it short. KUDOS to BILLY BLANKS who brought the encouragement, the Jerry’s, and his M to the big kickoff! its always a treat. Words about the mission of F3 were spoken due to the evangelistic nature of the black ops. Slots and Four Eyes went to Town on this challenge. I’m glad they had each other to be pushed by, cause YHC was outta gas. WOW hung in for the entire 4 rounds, only modifying the number of reps, and kept up the encouragement. Quikrete had already done about 3 laps around the mile track before we got rolling and was pretty winded. He did a round and assisted in the Clipboard Q with Nature Boy after that. Nature Boy brought the encouragement and was pushing everyone through. I hadn’t really thought about calling out times and keeping up with rep counts, so it was very helpful. Woke hung in for the first round, then jogged a bit and encouraged the finishers. Everyone did a great job, the challenge was difficult and taxing to say the least, and YHC is glad to have been apart of it. Tclaps to everyone who participated in this challenge. Grow ruck, and the City Tour was mentioned. Begin with 5 reps then add 5 each set. We got up to 20. Mark chapter 2 tells of when Jesus was surrounded by a crowd. There was no way to get near him but a paralytic and his friends found a way. They went through the roof. HIM need to make a way forward, be intentional about moving toward Jesus. What imaginary obstacles stand between you and your purpose? Move forward, make a way, pursue Jesus.